Buttons are my nemesis. I hate sewing them on – it was a happy day when I discovered it can be done by machine for shirt buttons – and buttons sewn on by me don’t stay on. 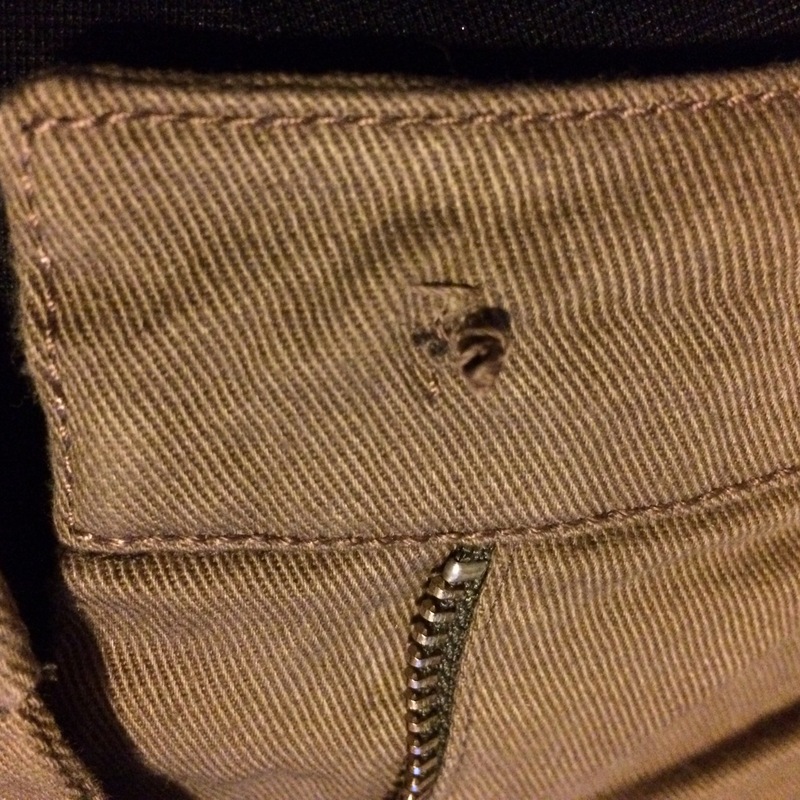 Lately I was having to sew the button back on my favourite trousers every few wears. This was puzzling. I’ve put on weight since I originally made them but not that much. I originally sewed the button on with regular polyester thread. After it first came off I started sewing it on with topstitching thread. It didn’t help. I sewed it on last week with the nuclear option: waxed topstitching thread. Today it came off yet again and I noticed something odd. The thread hadn’t actually broken. Hard to see in this photo but I assure you it’s true. What was broken was the button. There’s a neat little channel linking the original holes, allowing it to just slip off. Posted on January 8, 2017 January 8, 2017 by catherinedaze	This entry was posted in Rants, sewing, thread and tagged button, rants, sewing. Bookmark the permalink. I’ve had a button break in this way too! At the time I blamed it on cheap, plastic ready-to-wear. Might have been how it was attached tho’…. don’t know. Have you ever tried sewing a small button on the reverse of the fabric underneath the larger button? One of my son’s new coat buttons came loose this week, and what interested me was that the large button had come loose and separated from the smaller button on the inside of the coat. The smaller button was still very firmly attached to the coat. I’ve obviously still got much to learn about buttoning. I was going to suggest what pennylibrarian said: what about sewing a backing button on to the reverse to take some of the strain? This is something I do for my coats and I have never lost a button. LOL. Have you tried a few rounds of that clear plastic (nylon?) thread that looks like fishing line? I’m sure it has a proper name, but it escapes me. What really irritates me are snaps and hooks and eyes. Why can’t they stay on?? Dang! I’d probably have lost the button, never to be found again if it had fallen off… I have use the sew a button on the inside before – it seems to work well, at least with coat buttons. Probably wouldn’t hurt to try it with trousers though.